Landing a Backflip is coveted achievement in the world of Mega Trucks. Only a handful of drivers have conquered this monumental task. With most of them ending in failure and broken parts. One of the worst backflip crashes we have ever seen goes to Al Abercrombie. In this Backflip Gone Wrong he attempted a Backflip in his Adrenaline Rush Mega Mud Truck at West Georgia Mud Park during a Mega Truck Series event. At first glance it looks like he is lined up and should be able to pull it off. Sadly the initial impact of the front suspension into the ramp sends both front shocks through the hood. This sends the trucks straight up into the air. It comes down hard on the rear axle as the landing rips the front axle completely out from under the truck. Al climbed out of the wreckage unscathed vowing to make a comeback from this Backflip Gone Wrong. For more Backflips Check out the Busted Knuckle Video Youtube Channel. 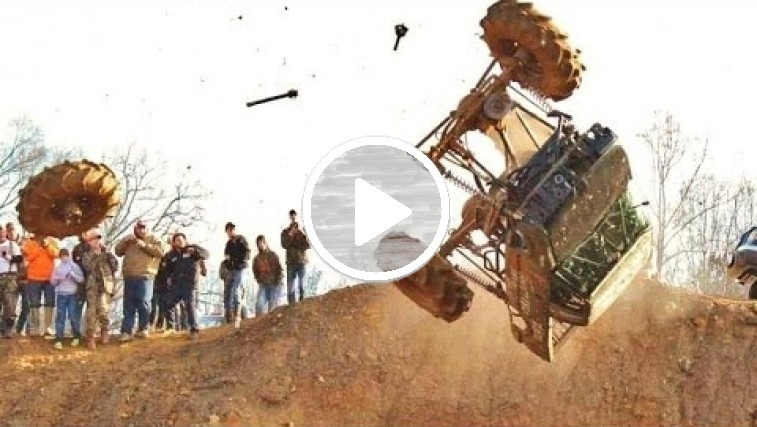 Check out this Mega Truck Backflip Gone Wrong or did it go Right?